Dr. Steve Sjuggerud coined this phrase years ago to describe one of his top investing strategies. He believes it's a simple way to find triple-digit opportunities in the markets. At its core, bad to less bad trading is easy to understand... It's a way to find beaten-down assets. Ideally, they should have recently fallen 50% or more. A little bit of good news happens. People realize it isn't the end of the world. And prices start to climb. That's when you want to step in and buy the asset. The best returns come when things go from bad to less bad... during the initial stages of a rally. By the time things get "good" again, you've missed most of the opportunity. Chipotle is the best fast-service restaurant startup since burger giant McDonald's (MCD) launched in the 1950s. The company – whose slogan is "Food With Integrity" – opened its first store in 1993 in Denver, Colorado. It sells burritos and tacos made with fresh, high-quality ingredients free of antibiotics. It's a healthy alternative to conventional fast food. This model exists between "fast food" (think McDonald's) and "moderately priced casual dining" (think TGI Friday's) restaurants. Fast-casual restaurants don't offer table service like casual-dining restaurants. And they don't rely on frozen or processed ingredients like usual fast-food restaurants. In 2015, Business Insider noted that it had "unseated Subway as the healthy fast food of choice." Industry trade publication QSR Magazine put the company at No. 14 in its rankings of the top 50 quick-service and fast-casual brands, with about $4 billion in sales in 2014. But then, disaster struck... In late 2015, a food-safety scare hit the restaurant. Hundreds of customers in multiple states across the U.S. got sick after eating at its restaurants. The culprits were food-borne bacteria: E. coli, norovirus, and Salmonella. Customers began to shy away from Chipotle on fears that its food wasn't safe. 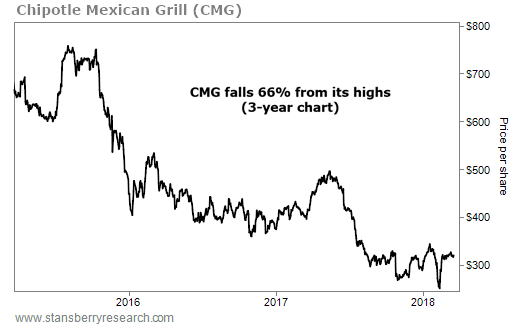 On February 13, 2018 – the day its stock bottomed – Chipotle appointed Brian Niccol as its new CEO. Niccol came to the company after serving as the CEO at fast-food rival Taco Bell. 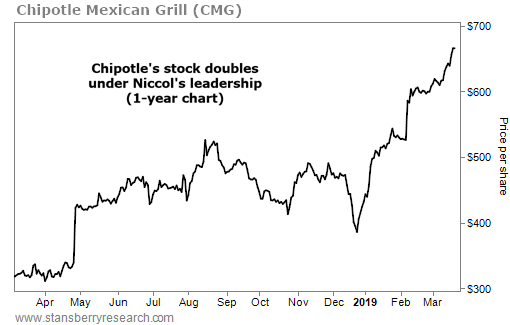 During one of his first conference calls with investors, Niccol said he planned to increase sales by "reminding people why they love Chipotle." He wanted to change the negative narrative surrounding the restaurant at the time... and bring trust back to its customers. During his stint at Taco Bell, Niccol overhauled the fast-food chain's digital approach – from mobile ordering and payment to its social media presence. He quickly brought similar changes to Chipotle, expanding its online presence to include "in-app" delivery at 2,000 stores. And just this month, Chipotle launched its long-awaited loyalty program nationwide. In 2018, Chipotle grew its digital sales by more than 40% – to more than $500 million. They accounted for almost 11% of total sales in only their first year as a strategic focus. 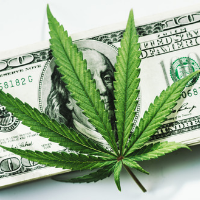 In February, the company reported $4.9 billion in revenue in 2018. It represented a 9% increase over the roughly $4.5 billion in sales during the previous year. So far this year, Chipotle's stock is up another 55%. It's at about $670 per share today. In other words, it's back to where it traded before the food-safety scare struck in late 2015. Chipotle is a world-class business that was simply beaten down over food-safety concerns. But when things got less bad, investors took notice. And now, even the overly pessimistic folks are piling back in... sending the company's shares higher every day.